I was loving the weather this past weekend in Los Angeles. At one time, I may have been one of those annoying Midwest ex-pats that complained about “missing the seasons,” but let’s be honest: Heat wave after heat wave into October does not a City of Angels make. We finally get to bring out the boots and maybe even sweaters. Late October is better than never, as they say. 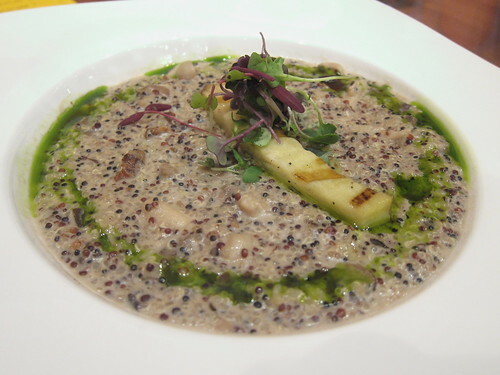 Inspired by the grey clouds as well as the feeling that we Southern Californians will always have one foot in the sunshine, I recalled Mo-Chica’s Quinotto – a quinoa-mushroom dish that invokes the consistency and tastes of a mushroom risotto. Drizzled with parsley-infused oil, this savory dish is perfect for the grey clouds that have been finally adorning our skies. 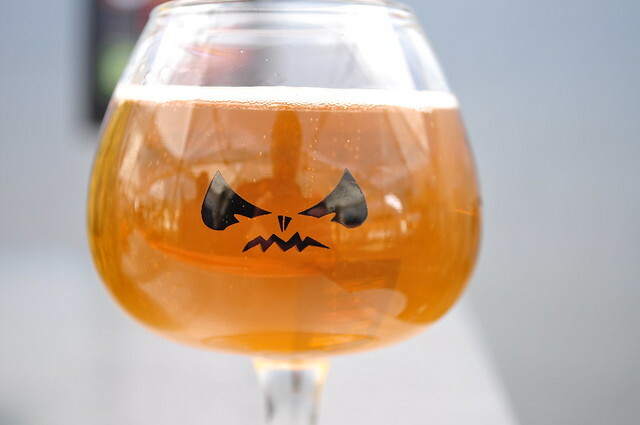 LA Beer Week(s) may be over, but Halloween’s not – and neither is your thirst for beer, I hear. When is it, ever? Why not combine the two by making a stop at my favorite neighborhood pub, Blue Palms Brewhouse, tomorrow starting 2 PM? Who needs to turn into a pumpkin at the end of the night when you can drink them at the duration, instead? See you at Pumpkin-palooza! Oh, right: Happy Halloween, too! 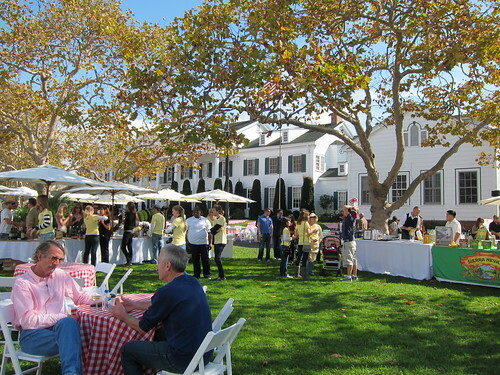 There were a lot of events going on over the weekend, but the inaugural LA Loves Alex’s Lemonade at Culver Studios was a culinary extravaganza to hit it out of the park. The backdrop? The famous Gone With the Wind mansion on a beautiful autumn day. Our hosts were Chefs Suzanne Goin and Caroline Styne (Lucques, AOC, Tavern) along with Chef David Lentz (Hungry Cat) – and there was a solid showing of chefs from across the country who all offered their live talents to an event whose goal was to fight childhood cancer. The standouts? 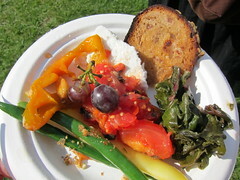 Chris Bianco’s Antipasto dish, featuring beautifully seasoned fall vegetables and almost making us forget that it was his pizza we were looking forward to. Celebrity chef Giada of The Food Network was personally on-hand to serve up her Pasta Ponza, topped with a fried prosciutto. 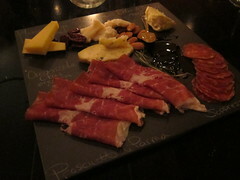 Paul Kahan, of The Publican in Chicago, brought forth a delicious house-made chorizo coupled with cured ham and dressed with arugula and apples. Hailing from New Orleans was a dish from Susan Spicer’s Bayona – a delicious grilled rosemary shrimp with artichoke bread pudding. Local Neal Fraser (Grace) had pig on the brain, or “Pig in a Box,” as he called it. We caught him reloading charcoal into his smoking apparatus and appreciated the pork he prepared, dressed with a side of mustard potatoes and brussel sprouts. With all the dishes at the event making it ever apparent that it was autumn in Los Angeles, the cocktails and beer did not pale in comparison. VIP had access to Craftsman Beer, offering up their Triple Sage, Lavender Sour, Poppy Fields and Firestone brews. Hungry Cat cocktails were also in VIP and out in the common area and were delicious as ever. Of course, we can’t forget the epic dessert table from Tavern and Lucques. 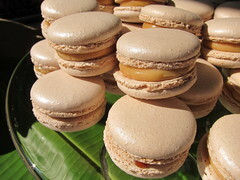 S’mores, caramel chocolate macarons, carrot cake – I didn’t even have room for a bite of everything on the table, though I wanted to. Fortunately, I was able to stuff in almost a half-scoop of Mozza’s Meyer Lemon Gelato. ItsÂ lemon zestÂ packed punch in the midst of a goat cheese-like flavor and consistency. If Caroline on Crack, Lindsay of LAist and I didn’t have somewhere else to be later that day, we would have surely enjoyed basking in the Culver City sun with our perfect cocktails, food, beer and desserts the rest of the afternoon. Overall, it was such a stand-out showing that I do hope the event moves from inaugural to annual. Sometimes, it’s not enough that you get a strong pour from the bar. 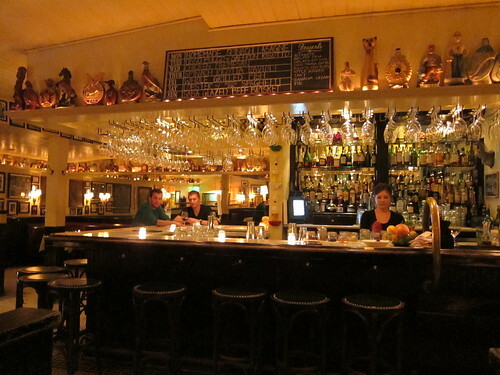 You want that bar to be worth your time as you enjoy your drink. Fortunately, Dominick’s has not one but a couple beautiful bars (a smaller one is just outside on their newly re-done patio) at which you can sip – and it’s a perfect setting within which to try their new fall cocktail menu. Much of what was there in 1948 is still at Dominick’s now, and the place has the charm and hospitality to match. Is West Hollywood not your speed? 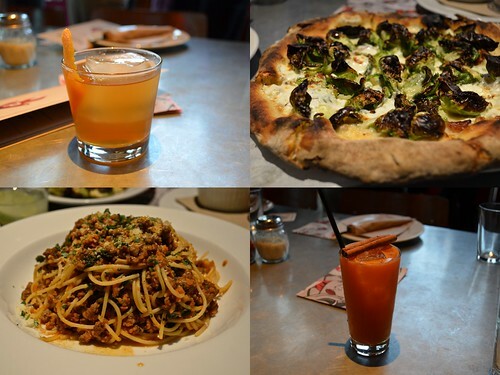 No problem – just hop on over to Little Dom’s in Los Feliz, where for the first time, they’ll also be featuring the sameÂ cocktail menu as Dominick’s. I was a latecomer to a preview first started off by Caroline on Crack, Daniel of Thirsty in LA and Aaron, the Savory Hunter, but got some pretty tasty sips in and deemed the Scotch Leaf my favorite original cocktail of theirs. Find the menu below with their explanations. My notes (if any) follow each cocktail. It was probably the maple bitters thatÂ really did it for me. The egg white wasn’t too obvious and I love how everything just really worked with the Scotch. Not the best executed Manhattan I’ve had (pretty watery) but it paled so much in comparison to the others that I’ll call it a fluke. This drink was created in the early 1920s by the Mob on the south side of Chicago. The gin at the time was not as palatable due to prohibition, so mint and/or basil and lemon were used to cover up the flavor. Dominickâ€™s version uses basil and cucumber and a very floral gin, Damrak, from Amsterdam. Basing my assumption on the color (a bright pink), I thought this would be a sweet drink but I was pleasantly surprised at how nuanced it really was. It had just enough Triple Sec and Raspberry to compliment the juniper in the gin. Delicious. Apparently, it’s meant to replace the Raspberry Lemonade from summertime, and I’d say it’s a great adaptation. This would easily be my mimosa replacement at any brunch time. So much more complex and even refreshing, with the absence of weighty orange juice. The solid tequila cocktailÂ stalwartÂ of the bunch. Very delicious and a great introduction – you’ll be hard-pressed to find another tequila cocktail that goes down smoother. So head on over to Dominick’s or Little Dom’s and taste the new fall cocktails we were lucky to enjoy. 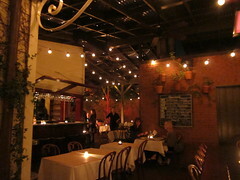 They’re really good and with the charming atmosphere and neighborhood vibe, you just can’t lose. The weather lately has confirmed that it’s officially fall in Los Angeles, and you may be looking for a good spot for a Sunday dinner as you wind down your weekend. 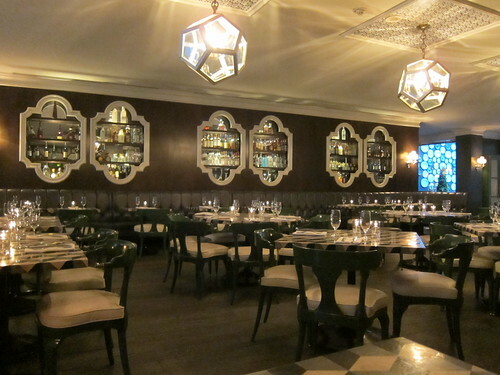 Thankfully, Savor Sundays at Whist are back and they’ve got four different rotating themes just to keep things interesting. 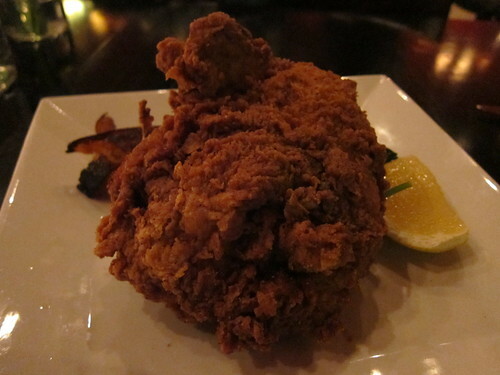 I had the opportunity to visit during their “Southern Favorites” theme and Executive Chef Tony DiSalvo as well as Chef de Cuisine Chris Crary did a great job comforting my guest and me with their buttermilk fried chicken. 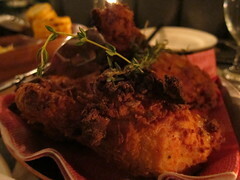 It was perfectly breaded on the outside and incredibly juicy and flavorful on the inside and out. 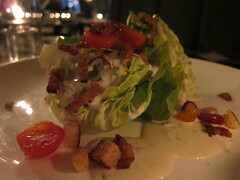 The butter lettuce wedge had a perfect buttermilk dressing, as well. Â The drinks were prepared nice and stiff. I’m curious to see how the other themed menus will turn out – and it’s up to you to find out. So be sure to make your reservation and enjoy a delicious fall Sunday dinner inside the beautiful Whist. Michael Shearin and his team put together a really good menu, and there are a few particular cocktails that I would order in a heartbeat. Caroline on Crack (her post) and Daniel of Thirsty In LA (his post) battled traffic to be at Drago and it was worth it, so it’s safe to say that these cocktails carry a bonus when you Metro it in – and to Metro it back out, again. The station is but a couple blocks away. The Dazed & Confused, which combines Casa Noble Crystal Tequila, Creole Shrub, Cherry Heering, Fresh Rosemary and Angostura, is a cocktail which Michael describes as “combining everything,” much like the inspiration for the cocktail itself. It’s a man’s drink and delicious enough for tequila drinkers. The Eponymous, which combines Appleton VX Rum, Cruzn Blackstrap Rum, Orgeat and Fresh Lime – is even more complex while utilizing rum, and pleasantly less sweet than one would normally expect a rum cocktail to be. 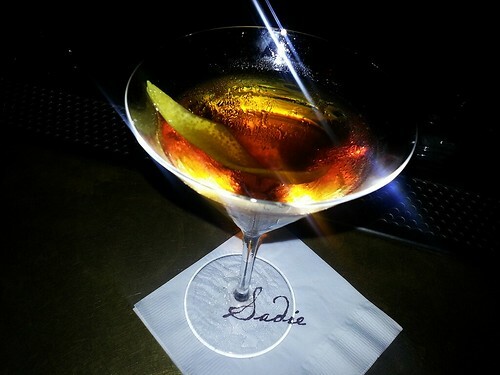 In fact, it evolves on your palate and is the drink that keeps on giving. Very nice. 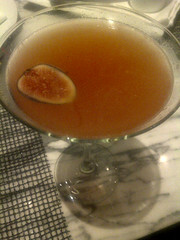 The 5th & Fig is a special drink, because I had actually loved this drink about a year ago – but Michael said they served it for about a week and then on a fluke, figs had suddenly gone out of season. So, it’s back and better than ever, and even earlier this year so hopefully the figs will be here to stay, for at least a little while. 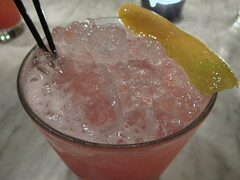 The cocktail is a perfect blend of savory and sweet while really highlighting the nuances of the shrub and complementing the flavors well. It’s a nice balance, perhaps for that indecisive moment where you don’t know if you’re in the mood for something sweet or hearty. 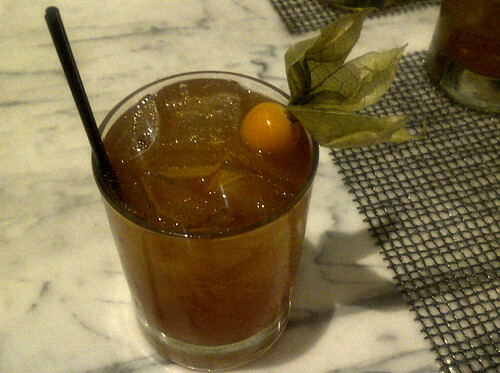 The Golden Goose is delightful bourbon drink with a lot of its charm derived from the gooseberry, itself. 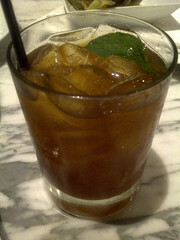 The Fernet is a really nice touch, which further highlights the earthiness in the bourbon. Just a touch of maple syrup is added, with compliments to Michael for not adding too much, and letting the gooseberry set the stage. The Greco Roman is a superb Sherry cocktail in my very little experience of Sherry cocktails. 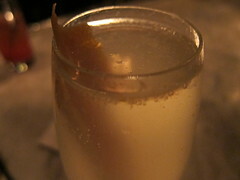 If I could ever muster a sherry craving (haven’t had one yet, to date), I could see this cocktail being my foray. Luxardo Morlacco does make it even sweeter but, I admit, perhaps a bit more palatable. The Fee Brothers Rhubarb Bitters, however, brings back in an earthy note. I guess when I make up my mind about sherry, I can have it alone. For now, it’s the Greco Roman. TheÂ Smitten With Britain, made withÂ Tanqueray Gin, Chives, Lime and Fever Tree Tonic is a beauty as it is an imaginative variation on your usual gin and tonic. 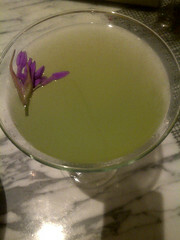 The added chives and lime make this cocktail refreshing – as I guess does the visual charm of the martini glass and purple blooms. Don’t spill. The Smokehouse features – let’s not kid ourselves – the bacon.Â Laphroaig 10-year-old Scotch is the liquid centerpiece, here, accented with Clear Creek Cranberry, Apfelkorn, fresh apple, Fee Bros, whiskey barrel bitters and candied bacon. The smoke is thanks to the Laphroaig. I’m pretty glad I didn’t get to taste all the individual ingredients that make up this drink, because otherwise it would have been just too much. 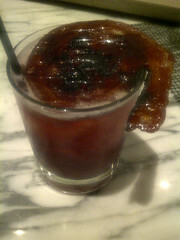 But this is your top savory cocktail on the menu – and the candied bacon swirl is alone reason enough to order this wonder. Michael gets away with not letting this one be too sweetÂ on top of the smoky – and the results are delicious. Don’t forget to order some appetizers while you’re enjoying your cocktail. And there are great bar bites to be had, like a blackÂ truffle-topped funghi calzone. Or order one of Jashmine Corpuz’s delectable sweet bites – her imaginative desserts will have you intrigued. So get to Drago Centro today: All cocktails are $8 each for the launch. 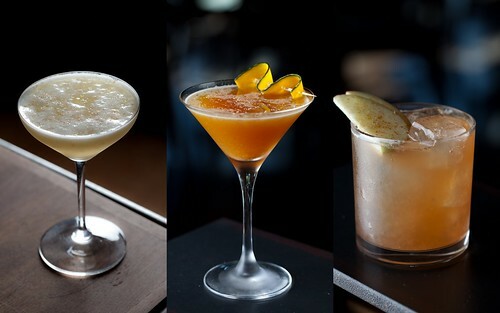 It’s a great day to figure out what your favorite downtown libation is.